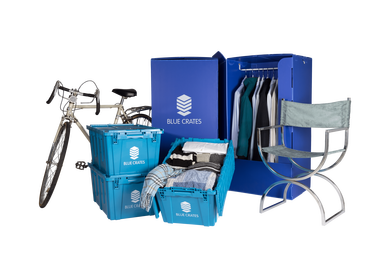 Store as little or as much as you need, Blue Crates is the perfect storage solution for all your space needs. with the power of the swap your closet has no limits. use blue crates for seasonal items and recall them when needed. Upload, attach or take pictures directly from your phone to create a digital catalog of all of your things in storage. Recall at the tap of a button. Got stuff that won’t fit in a crate or wardrobe? No worries! 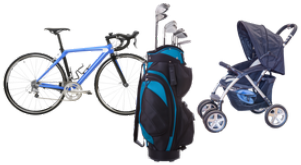 We’ll store a variety of over-sized items like your golf clubs, bike, stroller, and more! Blue Crates is amazing! Super friendly and immediate service, super responsive to emails and any questions/concerns are addressed very promptly! I moved from California to Chicago two months ago and have lived between three separate Airbnbs. I store half my stuff in Blue Crates. 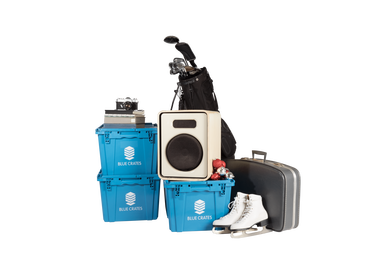 I have the guys from Blue Crates bring back some of my stuff for a swap once a month so I still have everything I need at any point in time! The cost for each bin is cheaper than a cocktail, and it helps me stay totally organized with their digital catalog and free swaps. Honestly you guys, this is the way to go if you need storage. I just makes so much sense. No hauling, no driving, no dimly-lit storage units, and you have easy access to your stuff (and an awesome digital catalog) when you need it. Great idea! Always recommend to my apartment residents! We had such a great experience that we are using it again! Great Idea and Solution for a lifer Urban Dweller...highly recommend. The delivery and pickup was awesome. I also encouraged my building's manager to add Blue Crates as an amenity for the entire building. What makes Blue Crates so great? Our cataloging system takes your organization to the next level. Snap a pic of exactly what’s in your crate. Our climate-controlled facilities are under constant surveillance to protect your goods. 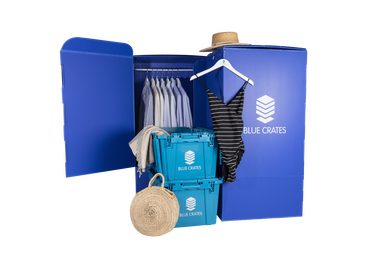 Our eco-friendly crates and wardrobes mean you never have to use cardboard again. What’s more important than saving time and space. Yup, we’re here for less than the cost of Netflix.